NASA's Kepler spacecraft has discovered 170 planetary systems containing between two and six transiting planets. This graphic shows all the multiple-planet systems discovered by Kepler as of 2/2/2011; orbits go through the entire mission (3.5 years). Hot colors to cool colors (red to yellow to green to cyan to blue to gray) indicate big planets to smaller planets, relative to the other planets in the system. Alien solar systems with multiple planets appear to be common in our galaxy, but most of them are quite different than our own, a new study finds. NASA's Kepler Space Telescope detected 1,235 alien planet candidates in its first four months of operation. Of those, 408 reside in multiple-planet systems, suggesting that our own configuration of multiple worlds orbiting a single star isn't so special. The Kepler spacecraft launched in March 2009, tasked with searching for Earth-size alien planets in their stars' habitable zones — that just-right range of distances that can support liquid water. Kepler finds these distant worlds by searching for tiny, telltale dips in a star's brightness that occur when a planet transits — or crosses in front of — it from Earth's perspective. The 1,235 candidate planets detected so far still need to be confirmed by follow-up studies, though researchers estimate at least 80 percent of them will pan out. "We didn't anticipate that we would find so many multiple-transit systems," said astronomer David Latham, of the Harvard-Smithsonian Center for Astrophysics, in a statement. "We thought we might see two or three. Instead, we found more than 100." Latham presented the findings today (May 23) at the 218th meeting of the American Astronomical Society in Boston. In our solar system, some planet orbits are tilted by up to 7 degrees, meaning that an alien astronomer looking for transits wouldn’t be able to detect all eight planets. In particular, they would miss Mercury and Venus, researchers said. 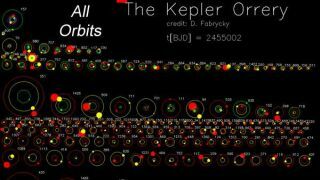 The planetary systems spotted by Kepler have orbits tilted less than 1 degree, they added. "Jupiters are the 800-pound gorillas stirring things up during the early history of these systems," Latham said. "Other studies have found plenty of systems with big planets, but they’re not flat." Finding multiple-planet systems is exciting for reasons beyond their superficial similarity to our own cosmic neighborhood. They could help astronomers confirm the densities of small, rocky, Earthlike alien worlds, which can be tough to pin down using the tried-and-true radial velocity method (which measures the wobble a large planet's gravity induces in its parent star). In systems with more than one transiting planet, astronomers can use a technique called transit timing variations. They can measure how the time between successive transits changes from orbit to orbit due to gravitational interactions between planets. The size of the effect depends on the planets' masses. "These planets are pulling and pushing on each other, and we can measure that," said Harvard-Smithsonian astronomer Matthew Holman. "Dozens of the systems Kepler found show signs of transit timing variations." As Kepler continues to gather data, it will be able to spot planets with wider orbits, including some in the habitable zones of their stars. Transit timing variations may play a key role in confirming the first rocky planets in their stars' habitable zones, researchers said.